You all know that I'm a mother of two very fun and rambunctious boys. This also mean lots of scraped knees, dirty socks, soccer and football memorabilia and legos spread everywhere in a thin layer no matter how much I try to fight it. I don't really have anything pink in the house (other than a pair of glorious rocking heels and a couple of shirts strictly on my side of the closet). We also don't have dolls (yet!) and I know very little about them, honestly. The other day somebody posted on local Facebook classifieds an American Girl Doll for sale. It's a 2013 retired version that comes with an extra outfit, a hat and a helmet. All this for a mere $275... $275 for a doll?? I mean, it's a cute doll and all but seriously? That's like most of our grocery budget for a month or a third of our mortgage. I don't get spending that kind of money on a doll either. All I can think is that it's a way to infect girls at the earliest possible age to be slaves to name brands and fashion labels. I bet many of the mothers who buy these things wear/have expensive tastes in jewelry, accessories and/or clothing. It's just part of our sheeple society. When I bought my daughter's doll they were $100. each. As you've mentioned, they can fetch much more money now that they are retired, so maybe they're not so bad if you can sell them for over twice the amount one bought them for? But I agree, to even spend $100. on a doll is a bit crazy. I have changed my spendy ways drastically since then (10 years ago now and counting)! They are American Girl dolls. Very good quality. My girls started with the Bitty Baby and my MIL moved them on to the doll that looks like each of them. Very expensive; the clothes, accessories and they even have furniture. I didn't purchase these things for my kids except the very first Bitty Baby for my oldest when she turned 2. In my opinion the Bitty Babies are worth it. They are very tough and a good quality. My girls, who are now 17 and 19 years old, loved those dolls. We still have them because they won't let me sell them. The other American Girl dolls, the characters in their books and the ones you can order to look like your child are excessive and unecessary, but to each his own. They do seem very over-priced if you buy them new, plus clothes, plus all the other stuff that goes with them. My only regret is that I didn't come up with this idea first! Well, my daughter has the older ones named Samantha and Felicity. They had books to read and later movies so it really brought the doll to life for her. She received them as gifts when she was old enough to take care of them so they still look perfect. My mom made her and the dolls matching dresses and she would bring the doll to church and set it right beside her. Still makes me smile:) Also, no one starved and all bills were paid even though we splurged on the dolls but I can understand how it's not for everyone. Your DH carries the MC1R recessive gene obviously b/c of his red hair, so if you also are a carrier(can be even if you don't personally have red hair)each of your children have 50% chance of having red hair. Green eyes are very rare in the general population. It's estimated that only 2% of the world's population have green eyes. Eye color is more complicated to predict as eye color traits are contained in multiple genes within our DNA. But red hair w/green eyes is even rarer. Most green eyed people have dark or blond hair. Trust me Lena, odds are 1 in 2 for each of your kids to be born red heads. Each child, not an average of the whole. So you can have no gingers or any number of to all gingers. I've been studying up on DNA and statistically this is how it works. They poop gold, real gold. 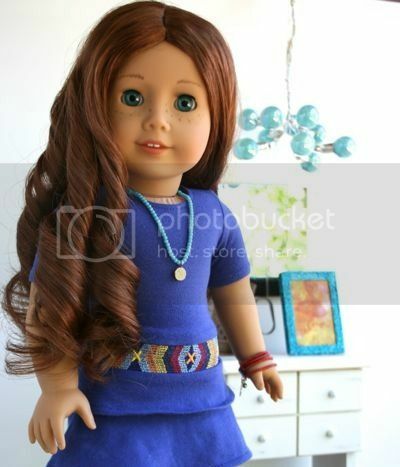 Some of the retired American Girl dolls command a high price tag. Once retired they are Collector's items. When our grand daughter was small we bought her Bitty Baby and I made some extra diapers for her. I used to receive the American Girl catalog and the accessories for the historical era dolls were gorgeous. We never purchased them, however, as Target has dolls similar to the American Girl line and accessories as well; much less expensive. Daughters and grand daughters are a lot of fun. We have grandsons, also, and they are equally precious. Been reading your blog for some time, but never commented. I enjoy your blog very much. I wouldn't sell that doll unless you have nothing to eat, lol!! :) But I still have a sticker shock... I imagine, some people have collections of dolls that could pay off our house, lol! And thank you for reading my blog :) I appreciate your support and your sweet comment. Wishing you the best! Do hope that you are feeling ok! I am so embarrassed to admit this but my daughter has several of these astronomically overpriced dolls. I'll admit we bought her ONE, and the rest she bought with her allowance that her grandmother gives her each month. Still, it is embarrassing. They're all boxed up in the garage now since she has outgrown them (she's 15 y.o. now) and I cannot wait to be rid of them. They are evidence of how we could have taught her better to be a better steward of her money. Also, I think allowing her to have these dolls was falling victim to "keeping up with the Joneses." Most of her friends were into the same dolls and accessories that you can buy to go with them. At least now my daughter wants to sell them, and she has become a great saver of her money since then! Yah.. it's a little bit of crazy, but hey, to each their own! ;) lol!! My daughter has several of these dolls. One was given to her as a gift when she was born because our families had waited so long for a little girl (she has a brother and seven boy cousins. :-) ) My Mom used to work for Pleasant Company and got several of the dolls with her employee discount when she worked there; she then handed them down to my daughter. We got her one for Christmas and she bought one with money she saved from Christmas and birthdays. Honestly? We love them and we think they're adorable! They have really, really, really cool, historically correct accessories and stories. My daughter loves the American Girl stories, which we check out from the library. Now - in all honesty - if the number of dolls we have equated to the number DH and I purchased, it would be one. I would never spend $275 for a doll, though. We spent in the $100 range for her BIG Christmas gift that year.